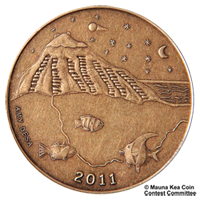 The winner of the 2014 Mauna Kea Coin Contest is Asia Nihipali-Sesson, a 4th grader at the Pahala Elementary School! Her design includes many aumakua, family gods, or ancestors, such as the honu and the mano. A navigator is heading for the mountain Maunakea, under a starry sky. Nine category winners and 3 special mentions were selected by Koa Rice and Kimo Pihana, Native Hawaiian cultural practicioners, and Nadine Manset, astronomer at the Canada-France-Hawaii Telescope and chair of the Mauna Kea Astronomy Outreach Committee. The Grand Judge, Olivier Lai, who is an astronomer at Gemini and Subaru Observatories, selected the three overall winners. The prizes were awarded at AstroDay in Hilo, on Saturday May 3. 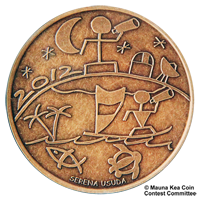 The 2014 bronze coin is for sale at the Mauna Kea Visitor Information Station (VIS) and its First Light E-Store. Asia attended the award ceremony with all her family. Judge Kimo Pihana (left) joined the happy group for a photo. 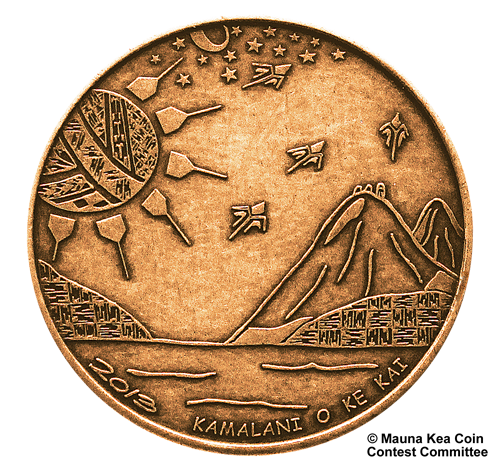 Mauna Kea Coin Contest 2014 is sponsored by Mauna Kea Astronomy Outreach Committee (MKAOC) a.k.a. Mauna Kea Observatories Outreach Committee (MKOOC), KTA Super Stores, `Imiloa Astronomy Center of Hawai`i, Onizuka Space Center, & Galaxy Garden/Paleaku Gardens Peace Sanctuary. Copyright © 2014 Mauna Kea Coin Contest Committee. All rights reserved.